The Plaza de Toros in Antequera is still one of the often used bullrings in Andalucia, where the art of the taurina hasn’t lost its legal right as in communities such as Catalonia. 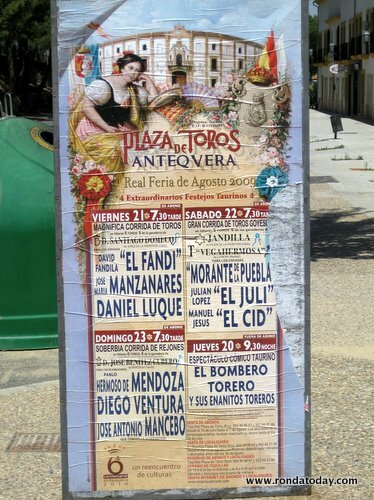 Within the Malaga province, the plaza de toros in Antequera continues to host corridas several times per year. 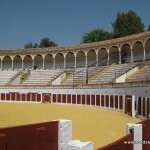 The bullring itself is often ignored by visitors to Andalucia due to its lack of fame, however this is a mistake for anyone with a genuine interest in architecture or the art of bullfighting. In fact the Plaza de Toros in Antequera is a very attractive building, and is surrounded by beautiful parklands close to the centre of the city. 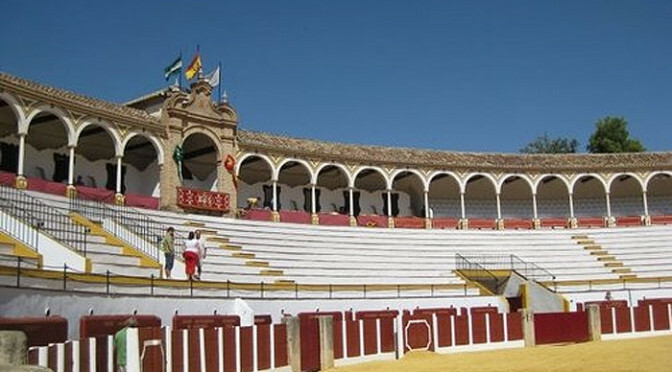 Architecturally, Antequera’s bullring is built using locally manufactured bricks, with a facade of white painted walls, and post-independence lintels above the doors. 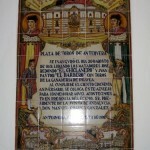 Inside, the rueda isn’t large, though the yellow sand is always immaculately smoothed out. 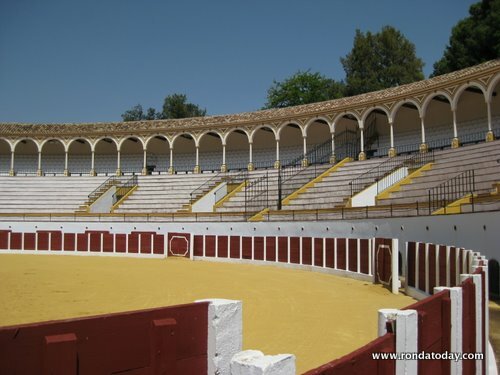 Dating from 1848, the structure was rebuilt in 1984, in a style that reflects the city’s diverse architectural influences, and is considered one of the most attractive bullrings in Spain. 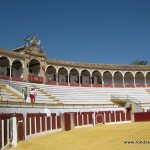 The Plaza de Toros in Antequera is a prime example of a classic bull ring. It has a seating capacity of 8,200 people. 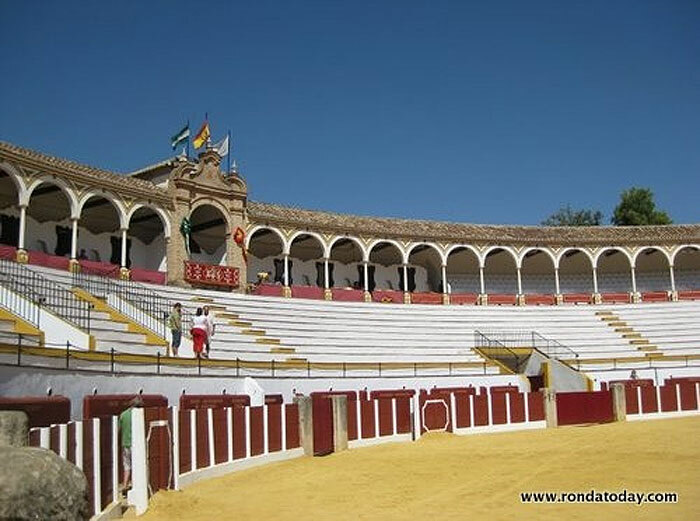 There is an excellent museum of bullfighting within the structure under the seats, which dare we say it, is often considered better than the RMR museum in Ronda. 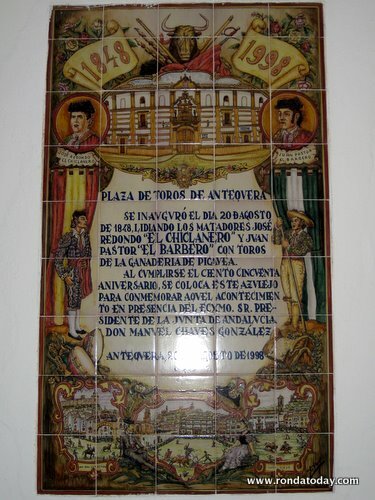 Numerous momentoes from former heroes of the art are on display, including a bronze statue by Sánchez Panadero and Clemente entitled ‘El Tiro de Mulillas’ (Mules dragging out a bull). 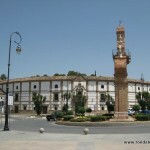 Antequera is an inland city in Malaga province, slightly more populous than Ronda, and by all indications occupied for nearly as long, though the archeological history of Antequra is different, with it’s two most striking asset being the three neolithic dolmen structures, two of which sit side by side, and the third about four km out of town. 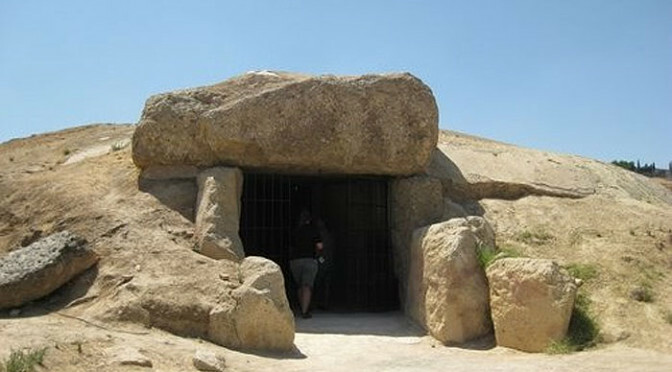 Built by farming communities whose presence has been established from 6,500 years ago, each of the three dolmens is different varying is size and features. The fertile soils of the Guadalhorce were attractive to early farmers, so of course they needed places to worship their gods. Originally part of a Roman citadel, the Alcazaba of Antequera has been an important fortress for and community centre for well over 8000 years as can be appreciated from the Dolmen structures situated just 2km away. Excavations around the hill containing the fortress show several Roman ruins that are under investigation, including tombs and the Roman baths. During the Visigothic era some of the Roman walls were modified, but little of the Visigothic period remain that is visible to the eye. 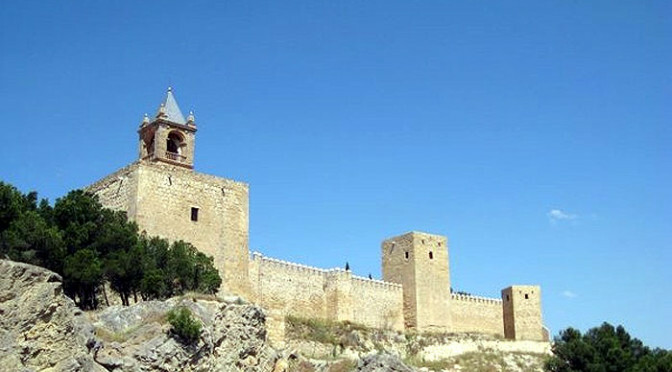 In the 11th century Antequera became a minor caliphate (taifa) and the beginnings of the current Alcazaba were started, including the overall geometry. 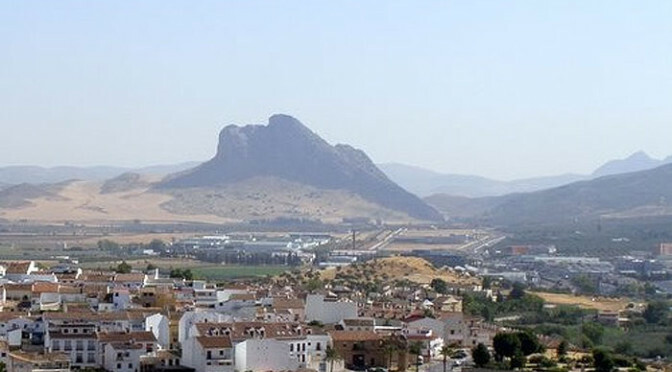 Close to the road joining Sevilla with Granada, a historically important route in Andalucia, travelers will come across a rock formation outside Antequera on the Archidona side of the city with the look of a human face staring up into the heavens. Known the Peña de los Enamorados, or in English either Lover’s Rock or Lover’s Leap, the rock has been immortalized by the likes of Cervantes, Washington Irving, and Lorenzo Valla to name just a few. The rock dominates the horizon and due to the legend of the doomed lovers has become an instantly recognizable symbol of the city. If you are on a road trip across Andalucia then a visit to Ronda is probably on your list but one other recommended place is the stunning area in Malaga province just an hour away from Ronda. The Guadalhorce reservoirs, The kings path (Caminito del Rey) and El Chorro are well worth a drive by and certainly a night in a local hotel. 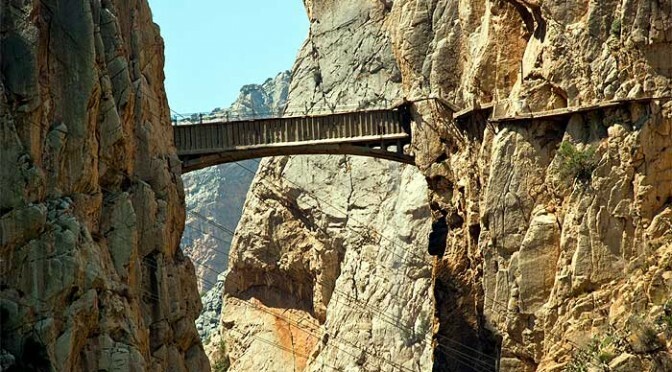 Famous for the terrifying footpath just a metre wide and hanging from the cliffs in a narrow gorge the kings path has almost been restored to it’s former glory. The Guadalhorce reservoirs are huge and the scenery breathtaking. Too much information to put on the Ronda Today website so we have built a dedicated website for this area over at www.caminodelrey.es All the information you need including hotel booking and articles about the area. 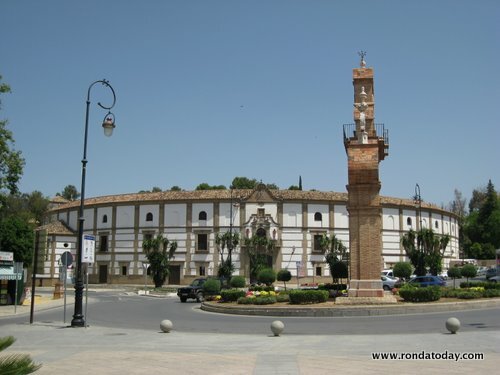 Ronda is quite central to most of the major tourist highlights of Andalucia, being just 45 minutes to the Costa del Sol or Antequera, an hour to Sevilla, Malaga or Jerez de la Frontrera, an hour and a half to Córdoba or Cadiz, and about 2 hours to Granada or Gibraltar. 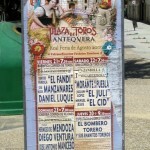 All in all, Ronda is the best place to stay if your holiday plans include seeing the Alhambra, the Mezquita, Malaga’s Picasso Museum, the Caminito del Rey (El Chorro), or the annual Jerez Horse Fair.